The U.S. Navy has conducted a live fire test of a Harpoon Block 1C missile aboard the Independence-class Littoral Combat Ship (LCS) USS Coronado during the Rim of the Pacific Exercise (RIMPAC) on July 19, a U.S. Navy video reveals. The missile was launched from a canister installed on the USS Coronado’s forward deck. Yet, while the launch of the missile was successful, the Harpoon failed to hit its over-the-horizon target, according to a U.S. Navy officer interviewed by Defense News. “The data is still being analyzed to determine what the missile profile looked like. Indications are it was a negative impact. But it was successful in validating our ability to deploy that missile off the ship and not damage the ship,” Larson added. The U.S. Navy is seeking to equip the LCS and its LCS frigate variants with a new over-the-horizon missile by the end of 2016 (See: “US Navy Wants New Missile for Littoral Combat Ship by End of 2016”) as part of a push to add more firepower to U.S. surface warships, a new warfighting concept known as the “distributed lethality” (see: “The US Navy’s New Surface Warfare Strategy: “Distributed Lethality”). The U.S. Navy intends to equip its fleet of LCSs with both the RGM-84D Harpoon Block 1C and the fifth-generation over-the-horizon Kongsberg Naval Strike Missile (NSM). (A NSM was test-fired from the USS Coronado in 2014.) 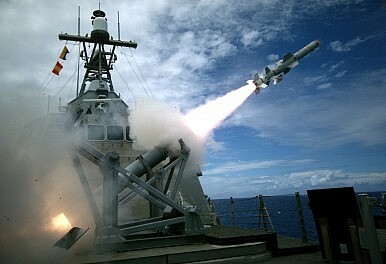 However, as of now, neither the Harpoon nor NSM have been integrated with the combat system of the LCS. “Harpoon in the present installation is a stand-alone weapon system,” Larson said. But this will change by the end of the year. As I reported elsewhere, both variants of the LCS are “specifically tailored for shallow coastal waters and can customize around 40 percent of its volume to adapt to different mission sets (minesweeping, anti-submarine warfare, surface combat, etc. ).” The ship program has been mired in controversy for a number of reasons including cost inflation and numerous design and construction issues.